Tri-Clamp® Type II Flanged Gasket Supplier in USA - SSP Manufacturing, Inc. The main purpose of sanitary gaskets is to seal clamp connections in sanitary pipe lines. 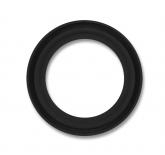 Tri-Clamp® Type II flanged gaskets are standard sanitary gaskets that are used in a number of applications and industries. 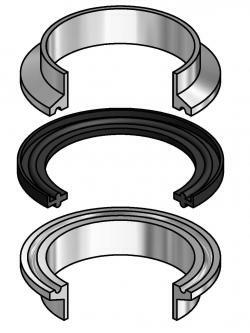 SSP Manufacturing, Inc. is a well-known provider of Tri-Clamp® Type II flanged sanitary gaskets. Buna N: Buna N has a relatively lower operating temperature range compared to the other materials. Thus, this material is particularly used for those applications, which involve less temperature variations. This material is not recommended for exposure to ozone or strong acids. This material can handle temperature variations from -30°F to 200°F. PTFE: PTFE material is highly resistant to process fluids. In addition to this, the material has low absorption rate, and least extractables. It is ideal for applications, where temperature varies from -100°F to 500°F. EPDM: EPDM is highly resistant to heat and ozone rays. In addition to this, the material has excellent mechanical, chemical, and wear resistant properties. The material has an operating temperature range from -30°F to 300°F. Gaskets made from this material are ideal for low pressure steam applications. FKM Fluoroelastomer: FKM Fluoroelastomer material has an excellent temperature resistance, and an amazing operating temperature range from -30°F to 400°F. The material has a good chemical, aging, weather, and oxygen stability. Platinum Silicone: The platinum silicone material has a decent operating temperature range, which varies from -40F° to 450°F. Gaskets made from these materials are typically used for low temperature applications. Tuf-Steel®: The Tuf-Steel® material is highly durable and gaskets made from this material are typically used for connections in extreme temperatures varying from -350°F to 550°F. SSP Manufacturing, Inc. is a leading provider of different types of sanitary gaskets that are used in various industrial applications. We provide fastest turnaround times in the industry. For more information about Tri-Clamp® Type II Flanged gaskets or any other type of gasket, please contact our experts at the earliest. They will help you with your requirements and also guide you in selecting the perfect sanitary gasket.